Laboratory Autoclave is designed to be ideal for critical applications requiring assured and reliable total destruction of all living micro- organisms. We provide Lab Steam Autoclaves at the best prices in the market, without compromising on quality or construction. 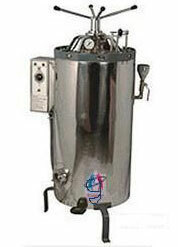 The company manufactures Laboratory Autoclave as an ideal tool for Laboratories, Hospitals, Nursing Homes, R&D labs, etc. Inner made of Stainless Steel and outer made of Mild Steel duly painted. Supporting Ring & Legs are made up of Mild Steel. Heater cover stand and bucket are made of Stainless Steel Sheet. Lid is made of thick machined Mild Steel plate lined with Stainless Steel from inside. Lid is fitted with Pressure Gauge, Spring Loaded Safety Valve, Manual Exhaust Valve, and water level indicator. Drain Valve facilitate easy cleaning of the chamber. Fitted with neoprene rubber gasket. Operating range from 15psi to 20psi pressure. To work on 220/230Volts, 50/60Hz AC supply.